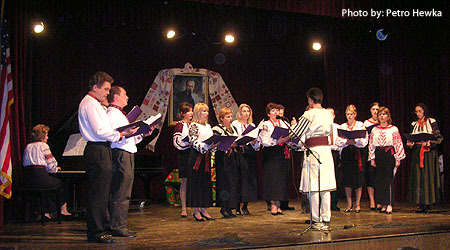 Chamber Choir "Akkolada" performs at the UECC Annual Taras Shevchenko Concert, March 12, 2006. Jenkintown, PA (March 12, 2006)  The Ukrainian Educational and Cultural Center (UECC - www.ukrainiancenterphila.org) and the Philadelphia Ukrainian community on Sunday, March 12, 2006 celebrated two important dates in Ukrainian history: the 192nd birthday of Taras Shevchenko, the great poet, prophet, and teacher of the Ukrainian Nation, and the 145th anniversary of Shevchenko's death. Ivan Prasko, Master of Ceremony, welcomed the Ukrainian Philadelphia community to the UECC Annual Shevchenko Concert at the Great Hall of the UECC, and introduced the talented performers. A portrait of Taras Shevchenko, adorned with an elaborate embroidered towel provided the backdrop for the performers. The chamber choir "Akkolada" ("Accolades"), under the leadership of Bohdan Gengalo, began the concert with a moving rendition of "Zapovit" ("Last Testament"). Two pupils from NURSH - the Ukrainian Heritage School, recited examples of Shevchenko's descriptive and expressive poetry. Natalie Midzak recited "Rozryta Mohyla" ("The Unearthed Burial Mound") and Alexander Zharovsky recited "Selo" ("The Village"). 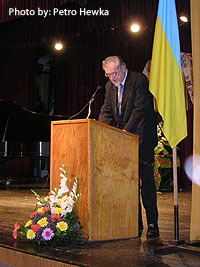 Leonid Rudnytzky, Ph.D., professor of comparative literature at La Salle University and the University of Pennsylvania, delivered the keynote address to an appreciative audience who listened attentively to his analysis of the universally acknowledged literary interpretation of Taras Shevchenko's works. His many references illustrated the ecumenism of Shevchenko's themes. They could apply to any culture at any time. Dr. Rudnytzky reminded us that we must read Shevchenko word by word. Shevchenko himself explains to us how he wants to be read. Especially noteworthy was Dr. Rudnytzky's reference to the "Kobzar" and its importance. Prof. Rudnytzky remarked "…as long as there is a "Kobzar" in one Ukrainian household, there will be a Ukraine." This brings to mind the quote "…as long as someone is writing the pysanka, there will be a Ukraine". UECC Annual Taras Shevchenko Concert - Keynote Speaker Prof. Dr. Leonid Rudnytzky delivers the address on “The Irrevocable Sacred Truth of the Kobzar”. A group of young bandura players from NURSH, Yuliya Stupen, Natalie Midzak, Katryna Midzak, and their instructor Halyna Bodnar, performed the song "Kobzari" in honor of the great Kobzar. Ivan Prasko entertained the audience with an artistic reading of "Hamaliya", while Vera Pavlishyn recited "Topolya" ("The Poplar"). The accomplished bandura player, Alla Kutsevych and singer Svitlana Karpiy, of the "Chetverta Khvylia Ensemble" ("Fourth Wave Ensemble") of New York, along with the Pavlishyn Sisters, Nadiya and Nataliya, sang familiar, lyrical Ukrainian songs, at one point inviting the audience to join them in song. Their beautiful selections showcased their talented voices and Alla Kutsevych's skill and mastery of the bandura. The chamber choir "Akkolada" performed "Nasha Duma" ("Our Thoughts"), "Chy My Sche Ziydemosya Znovu" ("Will We Meet Again") with solo performances by Marichka Hopka and Bohdan Gengalo and accompaniment on piano by Lesia Nestor, and concluded the concert with "Reve Ta Stohne" ("The Roar and Moan of the Dnipr"). Bohdan Gengalo stated that it was an honor for the choir to take part in honoring and celebrating the remarkable Shevchenko. Master of Ceremony Ivan Prasko thanked Dr. Leonid Rudnytzky for the keynote address on the theme "Nenarushymist' Pravdy Kobzarya" ("The Irrevocable Sacred Truth of the Kobzar"), the performers for a wonderful performance, the audience for attending, and all those responsible in organizing the annual concert. The Ukrainian Educational and Cultural Center, founded in 1980, is a non-profit organization whose objective is to preserve and promote awareness of Ukrainian heritage throughout the Philadelphia community. The UECC is located at 700 Cedar Road in Jenkintown, PA 19046 and can be reached at 215-663-1166 or e-mail at contact@ukrainiancenterphila.org. Please visit our website www.ukrainiancenterphila.org for photographs and video of this event. Щороку в день народження великого Тараса ми намагаємося виконати його заповіт. Ось і 12 березня Український Освітньо-Культурний Центр (УОКЦ) у Філадельфії влаштував святочний академію-концерт, щоби вшанувати пам'ять Кобзаря. У великій залі Центру зібралося чимало шанувальників поета. Портрет Тараса Шевченка, прикрашений вишивкою і квітами, зустрів всіх присутніх. Досвідчений ведучий Іван Праско ні на мить не втратив уваги глядачів. Програма концерту була насичена. У ній прозвучали поетичні твори Тараса Шевченка та пісні на його слова. Камерний хор "Акколада" під керівництвом Богдана Ґенґала виконав "Заповіт", "Наша дума", "Чи ми ще зійдемося знову" та "Реве та стогне Дніпр широкий...". Богдан Ґенґало сказав, що для хору є великою честю брати участь у вшануванні Кобзаря. Зі святочним словом "Ненарушимість правди Кобзаря" виступив професор др. Леонід Рудницький. Лейтмотивом доповіді була вічність поезії Т. Шевченка, зокрема його Кобзаря. Кобзар стоїть поза часом і простором. Він є новітньою Біблією для українського народу. Кобзар закликає до любови ближнього і батьківщини. Він забезпечує нам національне буття. Відрадно, що наймолодшими учасниками концерту були учні Нашої Рідної Української Школи (НУРШ). З декламаціями виступили Наталя Міджак ("Розрита могила") та Олександер Жаровський ("Село"). Гурт бандуристок НУРШ Юля Ступень, Наталя та Катруся Міджак і керівник Галина Боднар виконали пісню "Кобзарі". Затамувавши подих, заля слухала декламації Віри Павлишин ("Тополя") та Івана Праска ("Гамалія"). Віночок пісень на слова Шевченка у виконанні бандуристки з Нью-Йорку Алли Куцевич, співачки Світлани Карпій та юних сестер Надії й Наталки Павлишин не залишив байдужим жодного слухача. Український Освітньо-Культурний Центр, заснований 1980 року, неприбуткова організація котра зберігає і розповсюджує знання про Україну і українську культуру у Філадельфії і в околиці. Відвідайте УОК Центр при адресі: 700 Cedar Road, Jenkintown, PA 19046, дзвоніть по тел. 215-663-1166, або пишіть електронною поштою нам на адресу: contact@ukrainiancenterphila.org. Запрошуємо всіх відвідати веб сайт УОК Центра, www.ukrainiancenterphila.org , переглянути фотографії і відео цієї події.